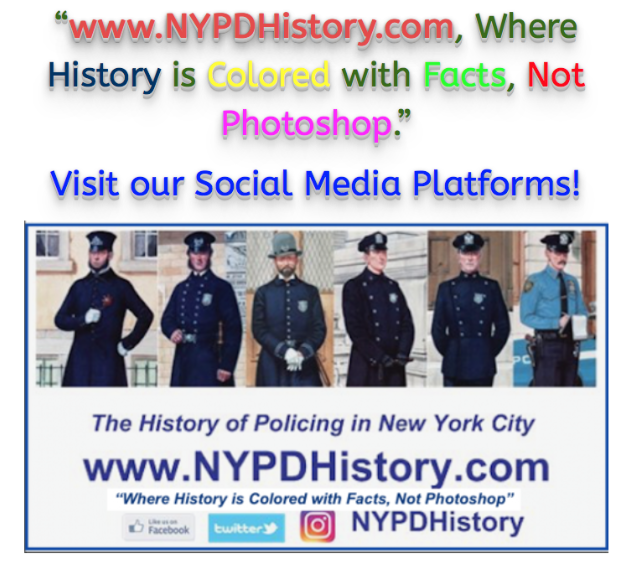 The biographies posted on NYPDHistory.com tend to cover officers whose careers have caused them to stand out from their peers. To date, some of the officers covered have stood out because of their heroism and valor, others for acts of graft and corruption. While researching, the author has gleaned over thousands of citations written about acts of heroism and valor performed by officers whose names are written into the history of “the job,” but have gone untold for decades. This short biography is the story of one such officer. Historically relevant information is contained along with the officer’s story. On August 30, 1940, Patrolman (Ptl.) 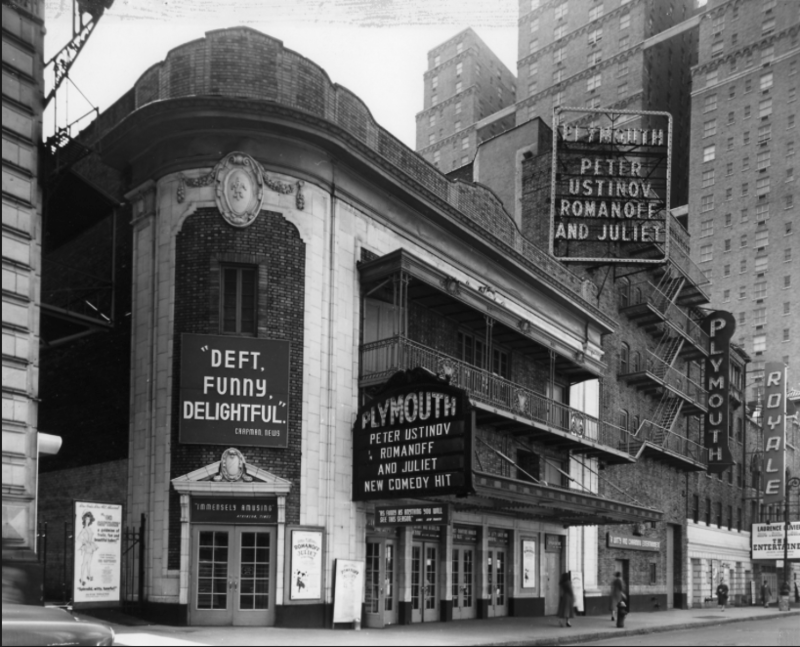 Joseph W. Schecker, Shield 15537, of Traffic Precinct B, was on traffic duty in the vicinity of the Plymouth Theater, located at 236 West 45th Street, Manhattan. 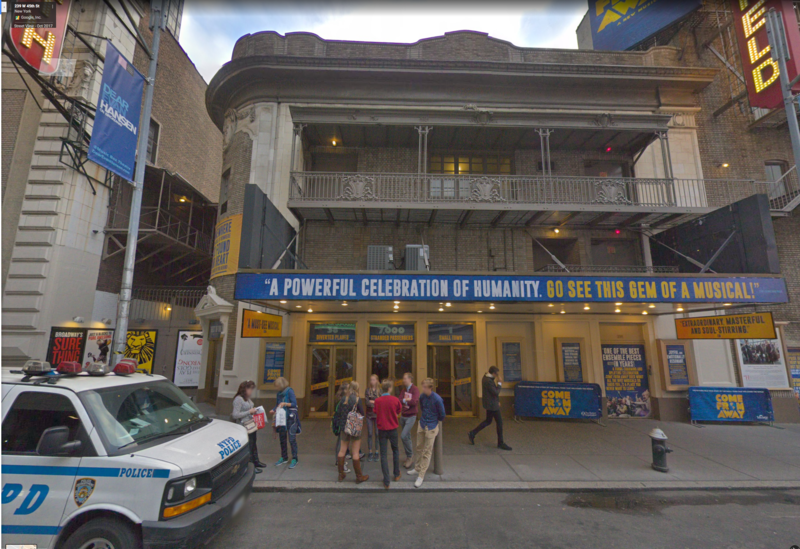 The location is now the Schoenfeld Theater. The last thing likely on Ptl. Schecker’s mind as he kept the pedestrians and vehicles moving in Manhattan’s Theater District was the Cuban Revolution. However, at 8:35 pm, as the lights of the Great White Way lit the streets, the desperate act of a Cuban Revolutionist would change his life forever. While directing traffic at 46th St. and Eighth Ave., an unidentified man approached Ptl. Schecker and excitedly exclaimed “That man has a gun and threatened to kill me!” Ptl. Schecker saw the man, revolver in hand, and pursued him east on 45th Street. Ptl Schecker ordered the man to surrender, but the man spun towards Ptl. Schecker, and fired two shots. One shot struck the theater’s doorman, the second struck Ptl. Shecker in the leg. Ptl. Schecker shot the gunman in the chest. 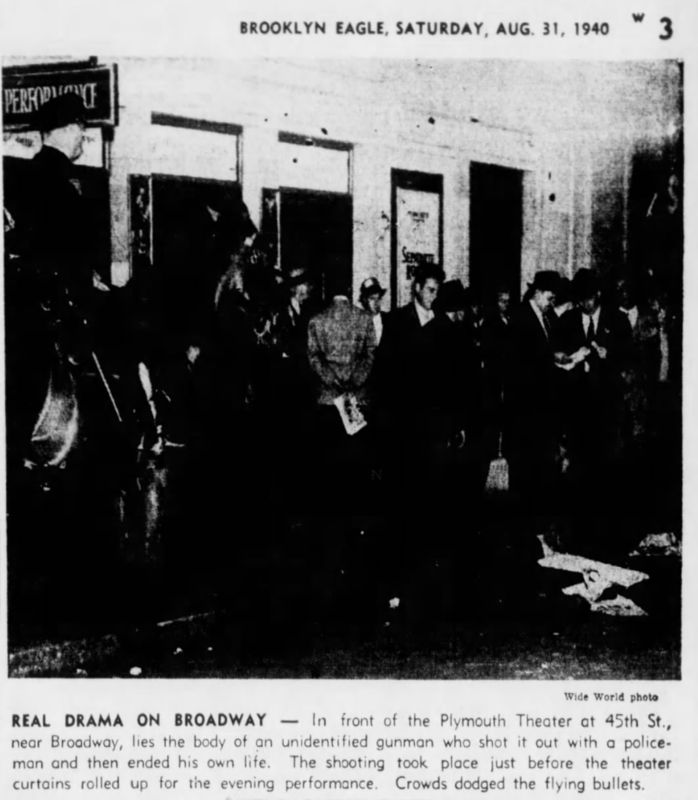 The gunman then shot himself in his temple and immediately died on the curb in front of the Plymouth Theater. Three thousand theater-goers witnessed the incident in which the doorman of the theater, who was assisting Ptl. Schecker was shot through the jaw. The gunman’s .38 caliber revolver contained five spent shell casings. The investigation of the incident identified the gunman as Julio Lima, age 34, a “political refugee” who fled Havana Cuba seeking refuge in the United States (USA). Lima was the son of Cuban Colonel Alfredo Lima who had taken part in the 1931 Cuban revolt. In 1933, Julio, a student at Havana University, was arrested by Cuban authorities in connection with a series of politically motivated bombings and was a member of a Cuban revolutionary group. Investigation further disclosed that Lima was wanted for a kidnapping and murder. Ptl. 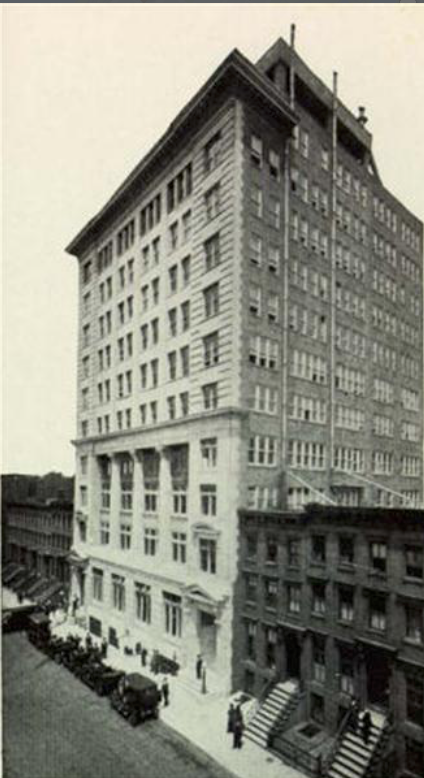 Schecker was treated for his wounds at the Polyclinic Hospital, 349 West 50th St. and remained on “Sick Report” for one month during his recovery. 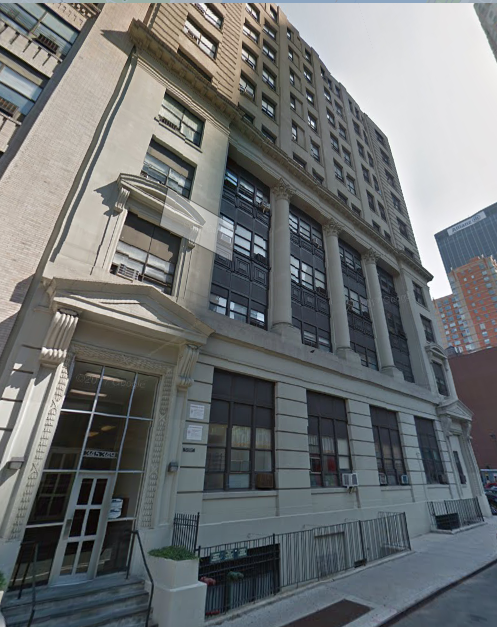 Polyclinic Hospital, 349 West 50th St.
On May 27, 1941, Mayor Fiorello LaGuardia and Police Commissioner Lewis J. Valentine presented 35 medals for acts that occurred in 1940 and resulted in Honorable Mention. The Medals of Honor were presented posthumously to the family members of officers who were killed in the line of duty. Fifteen Combat Crosses and 16 other medals were presented. On May 27, 1941, Ptl. 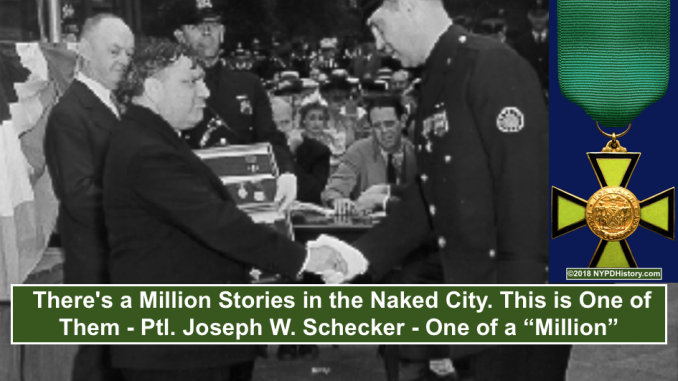 Schecker received the Combat Cross from Mayor LaGuardia at the ceremony held in City Hall Plaza. The Combat Cross was awarded for the successful performance of an act of extraordinary heroism when engaged in personal combat with an armed adversary at imminent personal hazard to live in the intelligence performance of duty. Ptl. Schecker’s actions certainly met the qualifications. On May 27, 1941, Ptl. 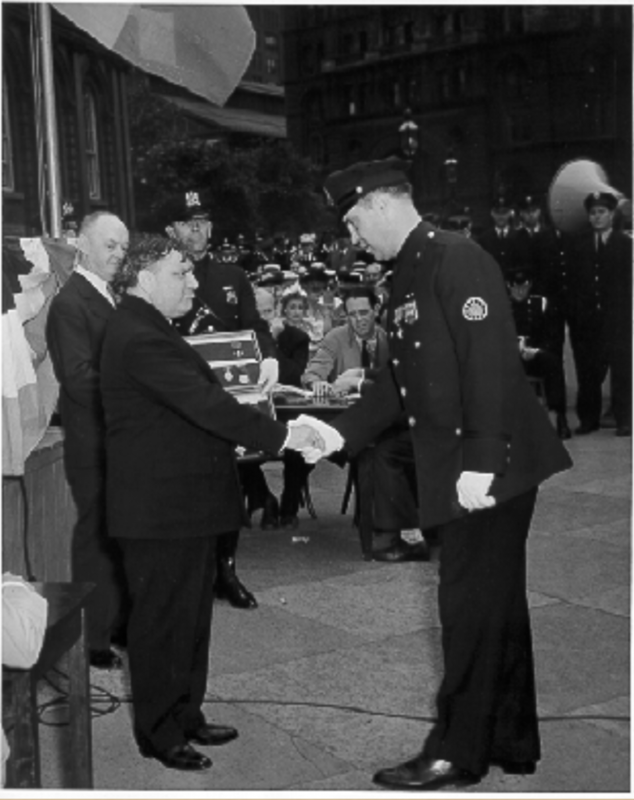 Schecker received the Combat Cross from Mayor LaGuardia at the ceremony held in City Hall Plaza. 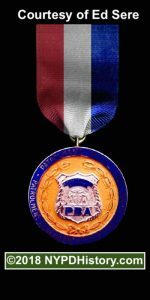 The Patrolmen’s Benevolent Association (PBA) Medal for Valor, an endowed medal that was to be presented in perpetuity, was presented for the first time. Ptl. Edward J. Kavanagh, 18th Precinct, was awarded the PBA medal for rescuing 5 children from a fire at 445 West 54th St. on June 11, 1940. In the post-Annual Police Parade era, the presentation of medals took place at various venues and were presided over by the mayor and police commissioner. By comparison to today’s ceremonies, sometimes hundreds of officers were cited. While there are many factors for the juxtaposition of numbers, it should be noted that the 1930s and 1940s was an era of violent crimes committed by gangs, “hold-up men,” and “hoodlums.” Incidents involving guns were very common. The murder rate, and number of officers killed, eclipse today’s numbers. On March 23, 1941, six months prior to the ceremony at which Ptl. Schecker, and others, received their medals, PC Valentine issued a General Order announcing the names of officers, and their acts, for the next medal ceremony to be held in May or June of 1941 at City Hall Plaza. At the forthcoming ceremony, medals were to be awarded for acts that occurred during the last six months of the calendar year 1940. The General Order contained the names of the 427 officers cited for meritorious service. Thirty-two received Honorable Mention, 164 received Commendations, and 231 received Excellent Police Duty. The 32 that received Honorable Mention, as well as 18 others who were previously cited by Honorable Mention, were candidates for the various medals that were to be awarded. Eligible for medals were Detectives Joseph J. Lynch, Shield 1423 and Ferdinand A. Socha, Shield 1117 who were killed while handling a bomb on July 4, 1940, at the World’s Fair. Both men were posthumously awarded the Department Medal of Honor. The case has not been solved. Ptl. Schecker was assigned to Traffic Precinct B , Traffic Division, which was also called the 17th Division at that time. The Station-house from which the squad operated was located at 19-21 Elizabeth Street, Manhattan, today’s 5th Precinct, Traffic B covered the streets & public thoroughfares from Battery Park to 20th St., from Broadway to the East River. There have been countless “Ptl. Scheckers” who, when duty called, risked their lives to save the lives of others. Perhaps his career ended with a chestful of medals, perhaps this was his only one. Regardless, his selfless act of bravery took a potential terrorist, accused murderer and kidnapper off the streets. To read the internet’s best article on the history of the evolution of the NYPD’s Department Medal of Honor, click here. Sources: NY Times, Brooklyn Daily Eagle, Annual Reports of the Police Department of the City of New York, Laguardia/Wagner Archives, PDNY Rules & Regs & Manual of Procedure 1940.